He's at that bloomin bathroom again! 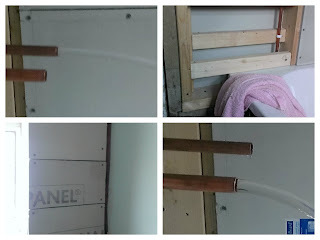 New to the Bathroom DIY Saga? Click here for the story so far! This months progress has been.... well, it LOOKS like he's not done very much, but he has. Honest! Those pipes in the picture? They're for the new shower. 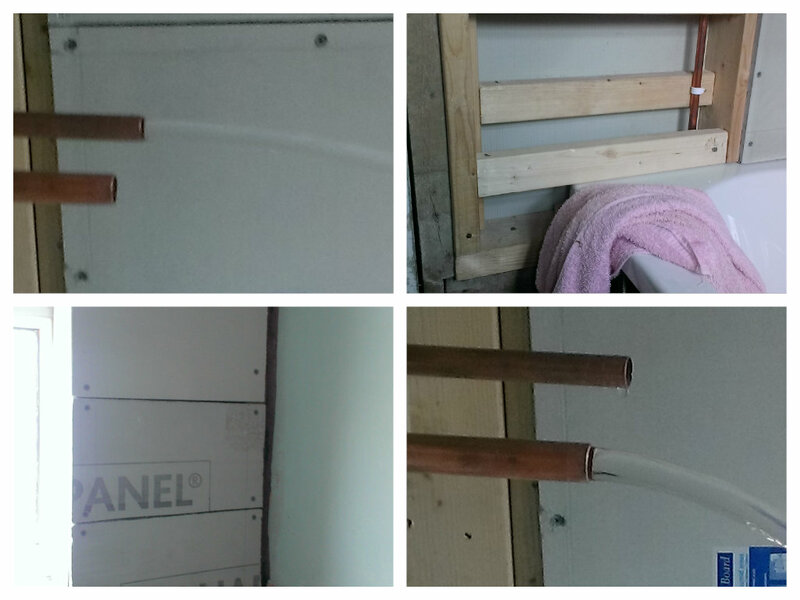 He's run pipes the length of the bath and up through the new wall, and there they are, WORKING and NOT LEAKING! That took him a fair while to do as he had about 6 inches of working space. And the wall. Why am I showing you the wall? It's because you can't see though it any more! You can now pee in peace in this house without kids hanging about on the stairs, peeping though the huge gap in the wall chanting "I can seeeeee yoooooooou!" And there is board going up around the new window too, almost all the way round now. I'm not kidding myself that this means we're any where near tiling yet. There's still more board to go up and we've run out, so that means I trip to Wickes on my own one day and getting one of the lovely staff there to help me out to the car with those huge sheets of Auqapanel (since he can't drive, and us both going means the kids go too, and then there's not room for the board!) Even when the board is up he still needs to plaster the other walls and what ever else before tiles can go up.